Experimental vehicles T1E4 through T1E6 were heavily influenced by the British Vickers E. The first prototype was manufactured by the Cunningham corporation in 1931. After trials in 1932, an upgraded variant was built. 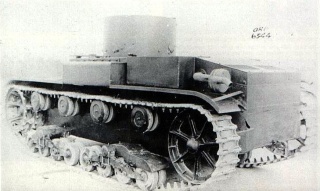 However, a different experimental tank, the T2, was preferred. A more advanced iteration of the T1 Cunningham, the T1E6 shares its thin armor, good speed, and 37mm semiautomatic gun. Unsurprisingly, the T1E6 behaves much like an improved T1, with upgraded speed, maneuverability, and gun handling characteristics. The t1E6 is currently unavailable to the public in any form of purchase, giveaway, or contest prize. The T1E6 at tier II is a later and more advanced version of the T1 Cunningham available at tier I. Players accustomed to the T1 will find that the T1E6 behaves similarly. 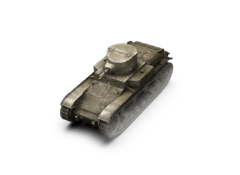 The T1E6 is a typical light tank, with great speed, acceleration, and maneuverability. Its armor is thin, and will only protect the tank from occasional machinegun fire at certain angles. The T1E6 may be a typical light tank in these regards, but its poor view range will prevent it from being an effective scout like some other lights. The T1E6 is armed with the same 37mm semiautomatic gun available on the T1 Cunningham and T2 Medium tank. The gun is highly inaccurate and has poor penetration and is thus only effective at close range. At close range however, the gun's five-shot magazine enables the T1E6 to do an average of 150 hitpoints of damage in just 2 seconds. Combined with a short reload of just 5 seconds, the T1E6 is capable of repeatedly dumping clips into enemy tanks quickly and efficiently. Capable of taking out most (or in some cases, all) of a tier II tank's health in one clip, the T1E6 is most dangerous late in the game where it can use its speed and maneuverability to single out damaged enemy tanks and quickly kill them with one clip. All modules are researched with the tank. After tests with the T1 light tanks, it determined that a frontal engine was not desired. In 1931, the Cunningham corporation presented its design for an improved version of the T1 Cunningham, called the T1E4. Testing began in 1932 and the tank originally had a 110hp engine. The weak engine caused the vehicle to stall when turning and other various problems. It was then equipped with a more powerful 140hp V-8 Cunningham engine. Eventually, it was decided to give the tank a 244hp engine. This new tank was called the T1E6. However, even with the enlarged engine compartment, it was very crowded and difficult to service the engine. The project was eventually dropped. This page was last modified on 6 November 2016, at 02:16.